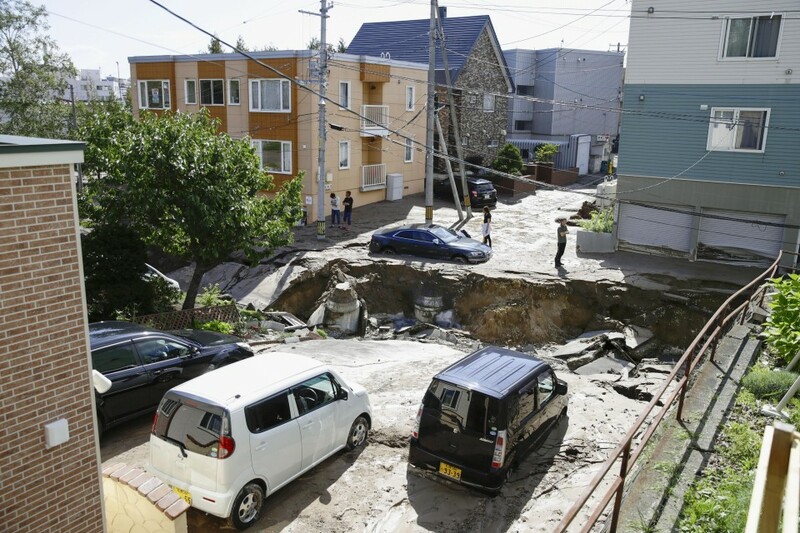 At least nine people were killed and about 300 injured by a magnitude 6.7 earthquake that struck Japan's northernmost main island of Hokkaido early Thursday, destroying houses, ripping apart roads and causing a number of massive landslides, including some that buried parts of towns. The 3:08 a.m. quake also cut power to all 2.95 million homes and a nuclear power plant in the prefecture, causing the cancellation of flights and disrupting train services to the popular tourist destination, authorities and other sources said. As of 5 p.m., power had been restored to 340,000 households. About 30 people are missing and more than 6,400 people took shelter at evacuation centers set up at over 500 locations, according to police, rescuers and local authorities. About 4,900 members of the Self-Defense Forces were quickly dispatched to assist with relief operations, with the number expected to increase to 25,000, according to the Defense Ministry. 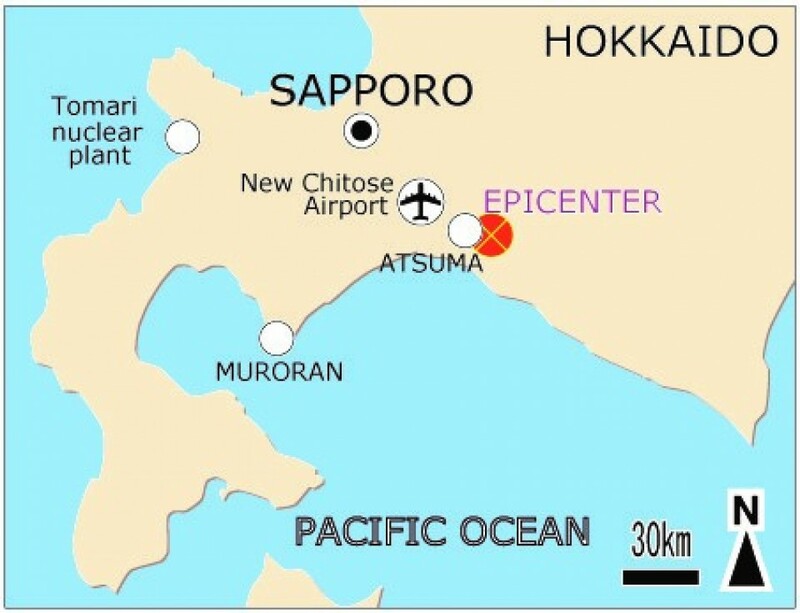 The temblor, which occurred in southern Hokkaido at a depth of about 37 kilometers, registered the highest reading of 7 on the Japanese seismic intensity scale in Atsuma and upper 6 in Abira, both southeast of Sapporo. No tsunami warning was issued. 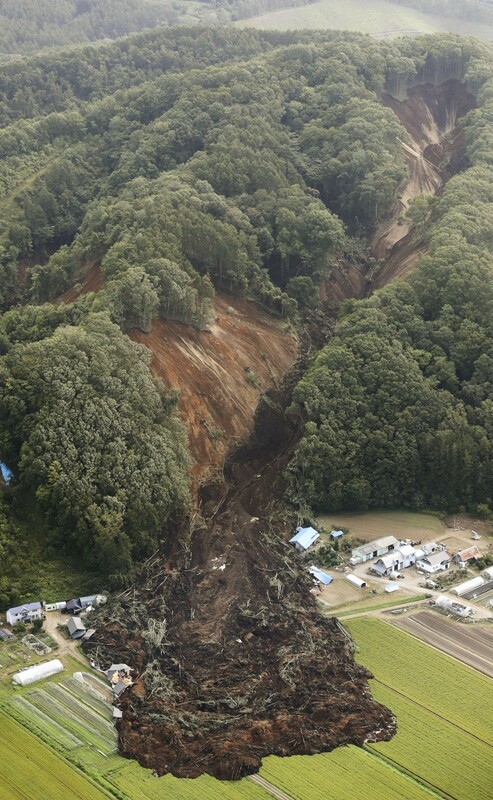 Smaller aftershocks continued and the Japan Meteorological Agency warned that earthquakes with a similar intensity could continue in the area for about a week. Quakes with an intensity of 7 occurred in 2016 in Kumamoto Prefecture, southwestern Japan, as well as in March 2011 when a huge M9.0 quake and subsequent tsunami devastated northeastern Japan. Thursday's quake is the latest in a series of natural disasters in Japan this year, and came just days after a powerful typhoon roared through western Japan, killing more than 11 people, injuring more than 400 and forcing the temporary shutdown of Kansai International Airport, one of the country's key gateways. A M6.1 quake also rocked Osaka Prefecture in June, killing five people and injuring more than 370. 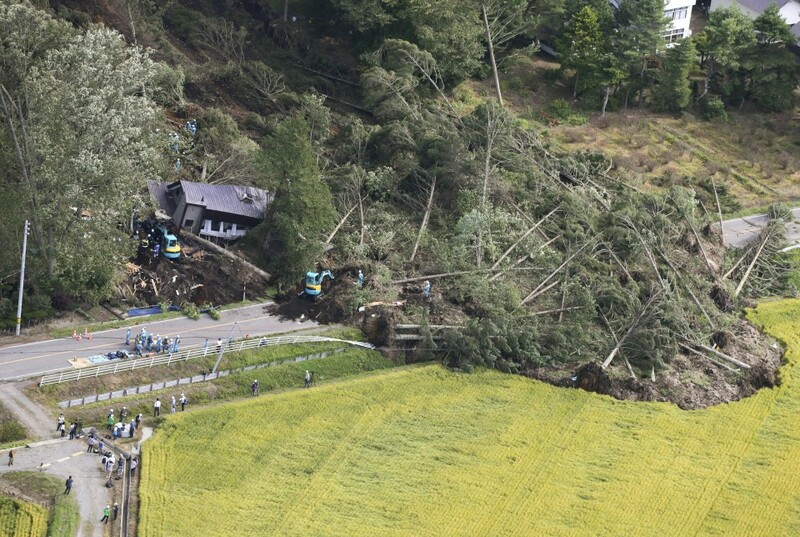 In the Hokkaido quake, more than 20 houses were flattened in Atsuma and Abira after being struck by landslides. And in neighboring Mukawa, a man in his 80s was crushed by a chest that toppled onto him, local police reported. Massive landslides altered the landscape of some mountain ranges in the quake-hit area. Hiroyuki Ono, a senior researcher at the Sabo and Landslide Technical Center, said that the ground in the area is loose, consisting partly of volcanic ash or eroded earth. "It couldn't hold together after being shaken so hard. It had rained beforehand, which may have also made things worse," he said. The idled Tomari nuclear power plant temporarily lost an external power source, forcing its operator Hokkaido Electric Power Co. to cool a spent fuel pool at its Nos. 1 to 3 reactors by an emergency power supply system, regulators said. No abnormality has been detected in radiation levels around the plant, the Nuclear Regulation Authority said. And Tohoku Electric Power Co. confirmed no problems at the Higashidori nuclear power plant in Aomori Prefecture south of Hokkaido. The incident brought back memories of the 2011 quake and subsequent tsunami, which knocked out both the main and emergency power supply at the Fukushima Daiichi nuclear plant and caused three reactors to melt down. The power outage across much of Hokkaido on Thursday was caused by a systemic showdown after the Tomatoatsuma thermal power plant, which produces nearly half of the prefecture's electricity, stopped. The resulting imbalance in power supply and demand forced other thermal power plants to come to an emergency halt, according to the plant's operator. 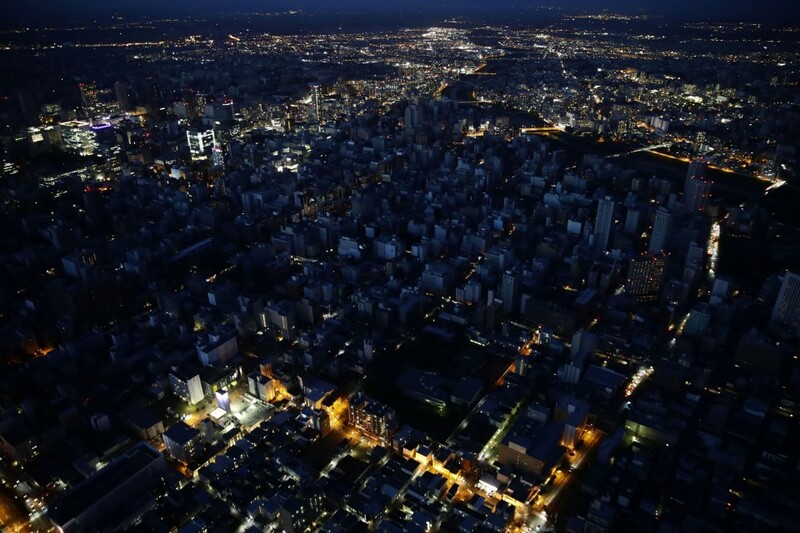 The blackout also affected around 80 hospitals, as well as telephone services and television broadcasts in Hokkaido. Hokkaido Electric said it would take at least a week to fully restore service. Following the quake, a fire broke out at a petrochemical complex in Muroran which was later extinguished by firefighters. Hokkaido has experienced a number of strong earthquakes in its history, including an M8.0 quake in 2003 with an intensity of lower 6 and an M8.2 quake with an intensity of 6 in 1994. "It messed up my entire house. I've never experienced an earthquake like this," an 87-year-old man in Atsuma said. Yuriko Nakamura said she evacuated to the gymnasium of an elementary school in Sapporo after the quake left the floor of her home covered in shattered dishes. "I can't live like this. What am I to do?" wondered the 70-year-old, who lives alone. New Chitose Airport, the main gateway to Hokkaido, was closed throughout the day after part of its terminal building ceiling collapsed, as well as due to a water leak and the power outage, the transport ministry said. More than 200 flights were canceled, affecting over 40,000 passengers. Power has been restored at the airport and its operator aims to resume domestic flights on Friday, the ministry said. Hakodate and Asahikawa airports are operating. All train services, including bullet train operations, in Hokkaido are suspended, operators said. About 2,000 public elementary, junior high and high schools decided to close for the day, according to the education ministry and the Sapporo government.